Students and workshop participants' testimonials from classes, workshops, and meditations. "I wanted to extend a thank you on behalf of the Guidance Department here at Yeshivah Of Flatbush High School for today's engaging presentation and conversation. You have clearly put much effort, time, and dedication into developing an array of resources and services that are so much needed in today's times. We are so appreciative of having the opportunity to ask questions, engage in discussion, and brainstorm ideas together with you. The team really enjoyed this time and this surely began a dialogue that will continue, as all of the topics explored today are ones that we face day to day. Your passion is evident and it's such a pleasure to see." Dr. Sitt’s informative and insightful presentation on mindful parenting was eye opening to our parents and faculty. Dr. Sitt gave us hands on strategies to use with our children and ourselves in order to help us be more aware and mindful of our own emotions, how they impact our children and how to help our children manage their own emotions in a positive way. "As someone who typically has a hard time sort of 'letting go,' this was incredibly helpful. Guided meditation like this is something I’ve been wanting to get more familiar with and this was a great intro. I practice yoga regularly and definitely see the physical benefits, but I noticed the mental calm far more in this setting." "As quick as the session was, it felt like a lot longer than 12 minutes. It really helped me find my center and just unwind from my technological woes. Essentially, it allowed me to reboot. Thank you!" "Just finished up a technology overload/mindful meditation class with the entire Beyda family and Dr. David Sitt! This was a very helpful & valuable workshop for us adults & all the kids. It's time for us to learn how to take control of our time and use it wisely. It is also necessary in this crazy era to carve out time for our thoughts. I HIGHLY RECOMMEND THIS! David is personable, knowledgable & witty." "Thank you so much for helping me enjoy a raisin. I will continue to practice and integrate mindful eating into my everyday life." "I found this workshop very interesting. From now on, I'm going to try my best to be mindful about the foods that I eat. I'm also happy to apply these techniques to my everyday life. Please do more workshops at WeWork!" "I just wanted to sincerely thank you for teaching that positive psychology class during the spring of 2013. At that stage of my life, that class was just what I needed to motivate me. I now own a lucrative business, largely because I was able to set my mind straight after everything I learned through positive psychology. I wish everyone can take this class, they're seriously missing out." "Dr. Sitt is one of the most influential professors in my college career. He was a mentor, teacher, friend and motivator. He taught in a way that engaged his students, far from conventional methods. I've taken away so much from his class that don't include facts, figures and definitions--but rather, real life lessons. 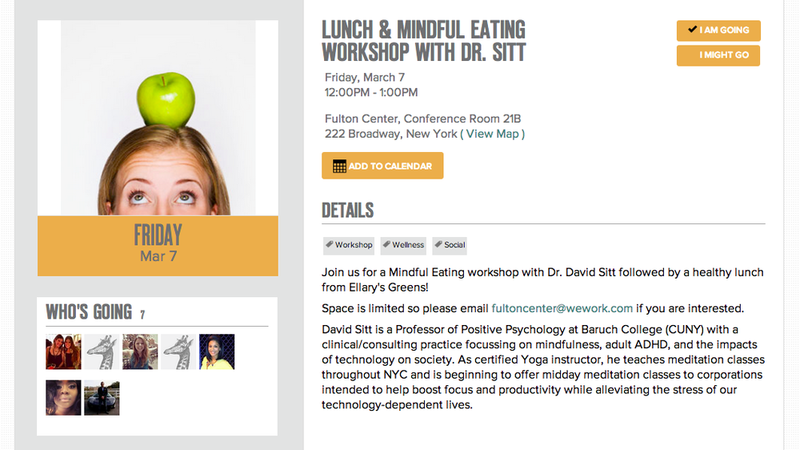 Dr. Sitt is passionate about his work and is truly an asset to Baruch College students."